For those connected to the Modern British section of the art world, the idea of a forthcoming large exhibition at Tate Britain of the works of Barbara Hepworth has been keenly anticipated. As the foreword to the catalogue proudly declared, this was to be the first time in almost fifty years that there had been such an event in London, and whilst there have of course been other Hepworth exhibitions in the interim, the prospect of a really great selection of works being allowed to show what this highly talented sculptor could do has seemed very much overdue. Thus when I went to Tate a couple of weeks ago, it was with real hopes for something special. I'm well aware that for this particular exhibition I'm in a fortunate position. Over the years I have encountered many of the pieces included here in other exhibitions and locations, both public and private. I've seen other Hepworth shows, including both parts of Tate's own St.Ives and Yorkshire Sculpture Park show of her work in 2003, and have visited many of the regional galleries and museums fortunate enough to hold examples of her work, including of course the artist's garden in St.Ives and the wonderful collection in Wakefield in the gallery that bears her name. I've also sold many pieces by Hepworth during my time in the art world, and have been lucky enough to have been able to spend extended time with some of her work, in the saleroom, in my office or in the homes of collectors. My library holds a shelf almost entirely filled with books and catalogues on Hepworth. As I wasn't able to get down to Tate when the exhibition opened, I thought I'd do things the opposite way from usual, and buy the catalogue before I visited. Knowing that the exhibition was very much the project of outgoing Tate Britain director Penelope Curtis, herself a known expert on Hepworth and British sculpture, I felt that this would be an interesting read before I toured the show. I've always found Hepworth a fascinating figure in the world of British art in the central period of the twentieth century, and reading the catalogue was indeed most illuminating. Ann Compton contributed a strong essay on Hepworth's path to becoming a carver in both wood and stone, very different materials, which quite rightly challenged the accepted view of her connection to these skills. Lee Beard's essay on Hepworth and husband Ben Nicholson's time in Hampstead and their presentation of their work was also intriguing, not least in that it brought out a very determined and self-aware element in their presentation of their work. This tied in neatly with the next essay by Valerie Holman which looked at the way that Hepworth appeared in the avant-garde publications of the inter-war period, the period when she was carving out (excuse the pun) the international reputation that the exhibition sought to highlight. Back in 1985, Tate had staged a landmark exhibition, St.Ives 1939-64, which did much to enshrine the pervasive idea of this small Cornish fishing village as the hub of modern art in Britain for almost three decades. Hepworth was of course a major figure in this show and concept, and the success of this exhibition, and later the opening of Tate St.Ives, confirmed a useful umbrella concept under which all manner of British abstraction and modernism could shelter, although perhaps with a tendency to overshadow other strands of advanced work, such as Constructivism and the artists working in London in the 1950s. Hepworth's link to St.Ives has become something of a given now, yet even during her lifetime the many films, articles and interviews stressed the influence of this location on her work. Originally understood to have been just one strand of many influences, over the years it has perhaps mutated in the general awareness of her work into a brand of seaside modernism that certainly does not give full credit to the substantial achievements of this artist on a much wider stage but which is very popular. Therefore, armed with my expectations from reading the catalogue and a reasonable familiarity with Hepworth's works and the writings on it, I headed to Tate Britain with a jaunty step. Spread over six rooms at Tate Britain, the exhibition occupies the same space that was used during the 2010 exhibition of Hepworth's modernist fellow, Henry Moore, and from the first room it was clear that we would be following a similar pattern, beginning with the juvenilia and early sculptures. 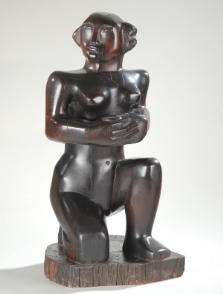 However, one line of thought in Ann Compton's essay had been concerned with the fact that it was not that unusual to find female carvers working in the 1920s, and this was highlighted here by the inclusion of a number of examples by these frequently rather obscure names, as well as early carvings by Moore and Hepworth's first husband, John Skeaping. As many of these carvings are relatively small, the first impression of entering this Hepworth exhibition is of a big, and important, piece by Jacob Epstein and then lots of small things by a variety of artists, often looking rather similar, mostly presented under large Perspex covers. I often find that the first room of an exhibition acts a little like a decompression chamber, somewhere that allows us to step from the outside world into the calmer and more thoughtful space occupied by the artist or artists whose work we have come to see and think about. If not like that, then it can sometimes be the place for a major statement of intent, the single great piece that will plant a clear marker of what we can expect to see next. This room did neither. The first half of the room felt too crowded, too fussy, to allow one to start to concentrate fully on these pieces, some of which are exquisite, and tease apart whose work was whose. I'm never a fan of intrusive labelling in galleries, but here one really did feel the need to know more just to tease apart the individual contributions. As one moved through the room, the balance started to shift a little towards the Hepworth we know - the pieces become a little larger, a little more distinctive, and have more space to breathe. The superb Corsehill stone Figure of a Woman from Tate of 1929-30 whose surface glitters and which exhibits a profile of a purity which takes your breath away, and the 1928 Contemplative Figure whose air of weariness and stillness is hugely moving, are both stand out pieces here, as are the more 'tribal' influenced works such as the large Torso of 1932 from Aberdeen Art Gallery and the small Torso of 1929 from the Whitworth Art Gallery. The simplicity and balance of these carvings really comes out strongly, and makes one wish they had been allowed a little more room to speak back to us. The star of the room though is the 1929 carving Infant in Burmese wood from the Tate collection. Perfectly balanced, with all the sentimental details usually de rigeur for a depiction of a child stripped away, it has an incredibly powerful aura, and, judging by the response of the viewers of all ages looking at it when I visited, one that is very keenly felt by those encountering it. Room two was essentially the Ben and Barbara show, and felt far too much like something that easily could, and should, have been an exhibition in its own right, and a fascinating one at that. However, as in the previous room, there were simply too many pieces jostling for our attention. I can fully see that the idea in Lee Beard's essay to explore the working relationship between these two prodigiously talented artists is a great one, and the attempts to try and mirror the set-ups that they had themselves tried out in the Mall Studios spaces they occupied in the late 1930s should have been a more satisfying one than it ends up. One reason that those photographs seem so captivating is the homely quality of the placement, and the shabbiness of the spaces, bringing that strong sense of the artist's atelier to life. In the concrete vastness of these Tate rooms, with the sculptures either roped off or trapped under Perspex, that sense of wonder was killed stone dead. Of course one cannot recreate these things completely in a large museum show with substantial numbers of visitors, but if the curators had been able to give this room even one tenth of the atmosphere and panache of Kettle's Yard in Cambridge, that gem of modernist display that has converted so many to its completely accessible concept of how to live with your art, then this room could have been a triumph. How far this was not the case was brought home to me by the 1933 alabaster Figure loaned from a private collection. I had actually included this piece in an exhibition I curated last year for a commercial gallery, and there, raised on a tall plinth so one met it almost at eye level and swathed in a low but warming light, it danced like a white flame. Visitor after visitor named it as one of their most covetable pieces in that show, yet here it looked static and bland, as lifeless as a specimen butterfly in a lepidopterist's cabinet. And yet, as I write this, looking through the exhibition catalogue to check titles and collections, it is clear that this room contains some fantastic pieces by both Barbara and Ben. Is this the tale of this exhibition - how to make great works of art appear not bad, but vaguely disappointing, which I think might be even worse? The third room, entitled "International Modernism", was more spacious, but thinking back to the Henry Moore show in 2010 and how impressively this room was used then to highlight his works of the same period as those of Hepworth's that fill it now, it surprised me how unmoving I found a lot of Hepworth's sculptures here. As in the first two rooms, there were several carvings here I know fairly well, such as Pierced Hemisphere I of 1937 from Hepworth Wakefield, Hellicoids in Sphere loaned from a private collection, or Tate's own Forms in Echelon from 1938, and I know that they have moved me before. These are beautiful pieces, whose materials and shapes call out to you, and which normally repay closer inspection. The subtlety with which Hepworth manipulates the simple basic forms she explores here is key to their success, and her instinctive feel for how to allow the warm glow of the wood to enliven a simple form or to let the white marble calm a more curvaceous form is a joy to see. To experience that talent in this room is often hard, as the placement of pieces that are too similar mean that one's study of a piece is constantly interrupted by its neighbours. The chance to see the gorgeous Discs in Echelon, Version I from MoMA, a piece that rarely travels, should be one to savour, but it's juxtaposition with another dark wood carving and two white marble carvings (each under their own Perspex box) cannot help but remind one of a modernist chessboard. Room four, "equilibrium", shows four of the best known, most beautiful and captivating works by Hepworth from the period during and just after WWII when she returned to carving. She had been in St.Ives since 1939 and had come to understand its shapes, light and textures, and these new elements were beginning to show in her work, both carved and drawn, combining with the modernist sensibilities of the earlier sculptures to great effect. If Pelagos, Wave or Pendour don't sing here, it's not because of the pieces failing in some way, so it has to be the display or the lighting. I'm not the tallest man in the world, but time after time I found that the pieces seemed to be presented very low down on their plinths. I want to look into them as I would the face of a friend, not peer down as if I were investigating a log in the garden. The pierced forms within these carvings need to be explored to see just how skilfully Hepworth has made them, how she uses the empty space to create an additional element of the sculpture and to open out the material. Wave, from SNGMA, Edinburgh, and Pelagos, from Tate, usually amaze with the way they seem to defy the material and create the intricate interplay of space and light, but here they struggle to fire the imagination. I've always been a fan of Hepworth's drawings, seeing in the abstract images that marvellous combination of a practical working out of a three-dimensional idea and her sheer joy in line and colour. Their purity and balance is so complete they even feel like sculptures themselves. Here I found them rather lost, looking small and insubstantial. Room five includes an interesting display of photographs, studies and collages, including a very informative section where Hepworth has stuck images of her own sculptures onto photos of existing modernist buildings to try out how they work inside and outside those spaces on a variety of scales (very well, it seems), and I found myself wishing the curators had perhaps tried out the same exercise themselves. There is also a large screen showing a film whose watchers rather crowd the archive material against the walls. Passing here, then you are suddenly presented with the Hepworth you've come to see, the conjuror of beautiful, sinuous and lithe forms that pulse with life, that twist and turn with an internal logic way beyond easy understanding. These four big guarea wood carvings dominate the room, their bulk lifted by the hollows and holes that Hepworth has drawn from them, and they really feel exciting and important. They feel like the kind of international sculptures that the international sculptor described in the catalogue would have made. Finally we are seeing sculptures that really make you want to linger and really explore their forms, absorb the interplay of shadows, of bulk and lightness, and the achingly tempting tactile qualities of these warm wooden blocks. Room six is the last one in the exhibition and it could have been dreadful, but it is actually the complete opposite. Breeze blocks and vinyl images of woodlands stuck to the wall might sound like a recipe for disaster in an exhibition like this, but curiously this curatorial recreation of a modernist architect's dream of a pavilion or grotto takes us on an interesting wander through some of her bronze sculptures which so often can feel heavy and clumsy beside her carvings. Curved Form (Trevalgan) of 1956 looks especially fine against this brutalist backdrop, perhaps as good as I've ever seen this piece, and together these bronzes provides a very welcome antidote to the beach, cliffs and blue sky version that has become all too familiar for presentation of Hepworth since the films of Dudley Shaw Ashton and John Read (1953 and 1961 respectively). I mentioned at the beginning that this exhibition was a project by Penelope Curtis,and many in our field will remember the much vilified Modern British Sculpture which she co-curated at the Royal Academy in 2011. I felt that show was unfairly savaged by the critics, but it did have a serious flaw in that each room seemed to exist in a vacuum, unrelated to its neighbours, making it feel rather like a series of papers given at an academic conference than a single unified entity. Does this exhibition suffer from some of the problems of the notorious RA show? In that each room seems to forget that it has neighbours either side, yes it does. Do individual rooms work as single units? Generally, yes. Does the art historian's desire to contextualise and inform outweigh the real voice of these genuinely beautiful works? Yes it does. Having arrived at the end of the show, I found myself disappointed by the first half and decided to walk back to the start to try again, looking around me as I went. Moving along from the great, if idiosyncratic, final room back through the show it became strangely much more revelatory, each room revealing a little more about the art and the artist so that I felt by room one that I understood better how Hepworth's long journey from Wakefield to New York by way of St.Ives had happened.